The MAKO Spearguns “Quick Weights” allow you to quickly and easily add or remove weight (without taking off your weightbelt). Once you are in the water, you may find that you have too little or too much weight. 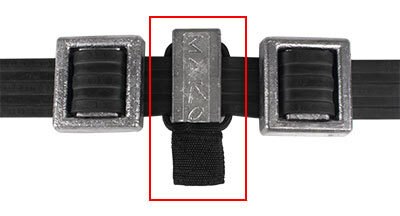 Don’t waste time taking off your belt to remove or add weights. 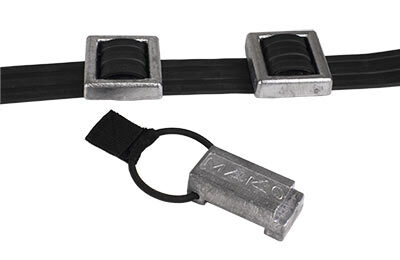 With the MAKO Quick Weights, you can add or remove weight while your belt is on. You can even do it while you are in the water. 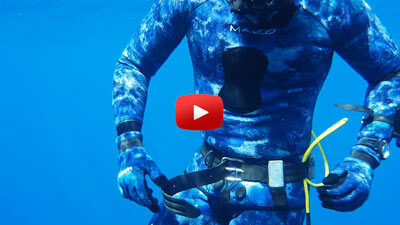 Spend more time spearfishing and freediving, and less time messing with your weight belt. Each Quick Weight weighs 1.6 lbs and includes a bungie strap and nylon tab for Quick and Easy removal. The bungie strap is replaceable. We offer a replacement bungie strap kit for $1.00. In many situations a belt is recoverable, however if your MAKO belt and lead weights are ditched (and lost) in a true emergency…. MAKO will replace them at our cost. I really like these weights. I bought 4 of them to try out - turned out to be a very good decision. I use them for scuba diving / teaching. They allow me to adjust weight distribution - to optimize trim - quickly. Not only can I put them on a weight belt easily, without removing other weights, I can also put them on a shoulder strap, cam band strap etc., to put weight where I want it (particularly on students), and gauge the trim effects of shifting weight position. Yes, on a cost / pound basis they are not inexpensive. But their functionality is worth extra money. These weights make it really easy to adjust weighting without having to get in and out of the water or to have to totally remove a belt, slide weights around and put back on.